In this special two-part course, explore modern art and music through contemplative looking and mindfulness techniques, in connection with the exhibition Masters of modern art from the Hermitage . Over two sessions, you will discover the art of mindful looking and listening, enjoying works of art and music in a more focused, attentive and curious way. Taking our cue from Kandinsky’s association of art and music, we will explore the connections between the innovative sounds of modern composers like Debussy and Schoenberg, and colour-driven paintings by artists including Monet, Matisse, Picasso and Kandinsky. Sessions are an intimate and exclusive experience with a small group of participants, and include two viewings of Masters of modern art from the Hermitage . Open to people with or without any mindfulness and meditation experience, the course will be led by mindfulness educator Steve Pozel and supported by art historian Josephine Touma, who will provide context and historical insights throughout the program. Steve Pozel has worked with leading creatives across design, craft, architecture and visual arts over the last four decades. He was director of The Power Plant, Canada’s premiere centre for contemporary art, before his role as CEO and Creative Director of the Australian Design Centre in Sydney. Recently, he has been exploring the intersection between creativity, innovation and mindfulness within both the educational and corporate sectors. Steve is a founding faculty member of The School of Life Sydney where he has been teaching the Understanding Mindfulness program since 2016. Steve will be presenting a special summer school program on art and mindfulness at the National Gallery in London in 2019. Josephine Touma is manager of public programs at the Art Gallery of NSW. She leads a team that produces programs to facilitate and enhance visitors’ experience of art, from talks and workshops to large-scale performances and festivals. With a passion for connecting art and people, she has a deep interest in encouraging the public discussion of art and culture in a way that is accessible, fun and meaningful. Josephine holds a PhD in art history and theory from the University of Sydney and writes and lectures across the range of Western art history. 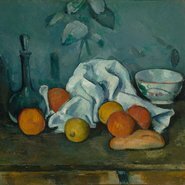 Image: Paul Cézanne Fruit 1879-80 (detail). The State Hermitage Museum, St Petersburg. Our first session will begin with a unique tour of the Masters of modern art from the Hermitage exhibition by Josephine Touma, introducing artworks from three key moments modernism, exploring their styles of painting and revealing their connections to music. Steve Pozel will give an overview of the various contemplative practices we will engage with throughout the course, as well as providing background on of some of the current neuroscientific understanding of mindfulness and how it relates to sensory perception. We will then continue with several guided practices alongside artworks in the exhibition. Please note: this session now ends at 9.15pm, not 9pm as originally advertised. In this morning session, we will have a second visit to the Masters of modern art from the Hermitage exhibition, in the hour before it opens to the public. The session begins with a sound meditation, followed by further contemplative viewing of paintings in the exhibition, interspersed with discussions and reflection. There will be an introduction to mindfulness of sound and music where we will listen to excerpts of compositions by Debussy (whose work is often associated with impressionist painting) and Schoenberg (a significant inspiration for Kandinsky). We will conclude the course with tea, refreshments and conversation.